Best Group of Guys Ever! Better than a football team; better than a Men’s Club; better than a precision military unit or SWAT team. These are the cream of the crop. These guys are princes! Yeah, I know that the Cardinals are called princes of the Church. I’ve met many of them including Cardinals Ratzinger, Schonborn, Wamala, Vidal, Arinze and others. But I am convinced these guys are the princes of the Church and was just as honored to be with them as any of the princes in their red regalia. 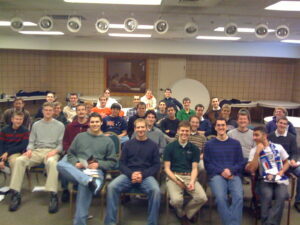 These are the young seminarians from the Diocese of Lansing Michigan. 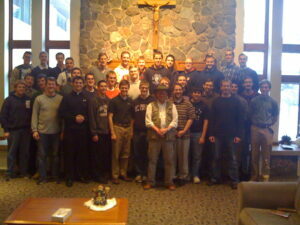 I talked to them for 3 1/2 hours today on their retreat. These are princes of the Church! I told them there was no monetary cost for my visit. I would never charge a penny to speak to the future priests of my own diocese. But I did tell them there was a big payback due as a result of my visit — they had to be good priests and take good care of my grandchildren. These are the men who will baptize my grandkids, confirm and hear the confessions of my descendants and care for them on their sick beds. They will feed them the Body and Blood of Christ. These are great men! I wish I could relay all that we talked about today and all the joy and tears that I had looking out over their bright, dedicated and eager faces. I love these guys! As lay people we need to go way out of our way to encourage, support, love and defend these dedicated young men. I am prouder to be a Catholic after being with them than I was before I drove the 1 1/2 hours to their retreat. I am prouder after being with them today than even after my time spent with the Cardinals. When asked to summarize what they could emulate in St. Paul I told them three things: 1) Be steadfast and unswerving with your eyes set on the goal; 2) love and faithfully teach the Scriptures and the Sacred Tradition; 3) devote yourselves to love God, his Church and his people as you would a beautiful bride. God bless you guys. I hope we can do this again some time. Keep up the good work.